Above are the basic science standards addressed in these Elementary Lesson Plans. More science, math and art standards could also be covered in this Unit. 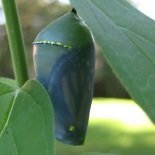 Discover the signs and what happens to the Monarch Chrysalis when it is time for the Butterfly to emerge. Explore how long this fourth stage lasts. Ask the students to recall Stage 1, 2 and 3 of the Monarch Butterfly Life Cycle. Review what the students learned about the Monarch Chrysalis Stage and what was the sign that the next stage is about to happen (the chrysalis starts to change in color). The Life Cycle of Butterflies by Judy Burris and Wayne Richards - Excellent book with over 400 beautiful photographs! We will be learning about the fourth stage of the Monarch Butterfly Life Cycle - the Monarch Butterfly. How do you know that is nearing the time when the Monarch Butterfly is going to emerge? The Chrysalis changes color and becomes darker. Then, within 24 hours, usually overnight the Chrysalis becomes almost black and you can actually SEE THE MONARCH BUTTERFLY WINGS THROUGH THE "SHELL" OF THE CHRYSALIS. This is AMAZING!! The Chrysalis starts to split from the bottom up and the butterfly appears in less than one minute! Its wings are all shriveled and its body is fat with fluid. It starts to pump that fluid into the wings and they start to "grow" until the wings are big and beautiful. The butterfly will hang very still for a few hours while its wings dry and then it will fly away. 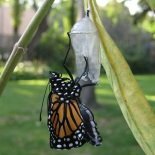 A MONARCH BUTTERFLY IS BORN!! Have the students draw a picture of something they learned about the fourth stage of the Monarch Butterfly Life Cycle. Have them share with the class what their picture represents. Update the time line on the blackboard to show the Monarch Butterfly Life Cycle through the butterfly stage. Have the students add to their “Virtual Butterfly” by representing the Butterfly that they learned about today. They have completed the Life Cycle of a Butterfly! Review Monarch Butterfly stage and the meaning of "Life Cylce". My new Monarch Life Cycle PowerPoint is the perfect complement to these monarch lesson plans.